Every year the Centers for Medicare & Medicaid Services (CMS), coinciding with the implementation of new CPT codes, revises the payment system for Medicare services. The final rules are out, and while the published changes will have a minimal impact on hospital payments for diagnostic radiology services, they will have a significant impact on physician payments for the same services. Fortunately, for hospital billing, the CMS has not created any new composite APs such as the advanced imaging composite currently in place. Unfortunately, for physician billing, the CMS has created two new families of codes that are subject to multiple procedure discounting that will reduce physician payment. This year, cardiovascular and ophthalmology procedures will be subject to multiple-procedure discounting of the physician technical component payment; the professional component will not be subject to discounting. This change in payment impacts procedures performed in a physician’s office, not in the hospital setting. The cardiovascular family includes services such as angiography radiological supervision and interpretation codes, noninvasive vascular procedure codes, cardiovascular nuclear medicine procedures, and cardiac catheterization. The ophthalmology family includes services such as ultrasound procedures of the eyes. The most significant impact to physician billing of radiology services is the new cardiovascular family. (For a full list of affected codes, see pages 166 to 169 in the Federal Register for a list of the cardiovascular codes and pages 169 to 170 for ophthalmology codes.) When one or more procedures from this family are performed, the technical component of the first procedure will be reimbursed at 100%, and the technical component of each additional procedure in the family will be reimbursed at 75% of the physician fee schedule. When a physician bills for a global service (professional and technical component together), the technical component of the global payment will be subject to the discounting formula for these procedures. One other change for this year is the discounting of several medicine procedures. Procedure codes 78802, 78803, 78806, and 78807 have been subject to the -51 modifier (multiple-procedure discounting) for a long time. This year, however, code 78306 (whole-body bone scan) will be discounted 50% when reported with 78320 (bone SPECT). There are significant changes in the Hospital Outpatient Prospective Payment System (HOPPS), the majority affecting cardiac catheterization and electrophysiology procedures. The only 2013 HOPPS change affecting the payment for radiology services worth mentioning is that the status indicator for code 19290, Preoperative placement of needle localization wire, breast, has changed from status indicator N (unconditionally bundled) to Q1 (conditionally bundled). If only a needle localization is performed at the facility (the patient goes to another provider for the biopsy), code 19290 will be reimbursed. Currently, no payment is received in this scenario. Several changes were made in CPT code descriptions to add to any physician terminology the phrase “or other qualified healthcare professional.” These codes are used by professionals, such as clinical nurse specialists and nurse practitioners, who are licensed to perform the described procedures and have their own provider number. The change in terminology identifies that but does not change their usage. One procedure code has been added to the list of procedures that include conscious sedation. Code 22522 describes vertebroplasty performed on an additional level. The initial level codes already include conscious sedation, so this change should not have any impact. • 32557, Pleural drainage, percutaneous, with insertion of indwelling catheter; with imaging guidance. The 2012 code for chest drainage with a catheter (32551) was changed to an open procedure designation. This code will no longer be appropriate for percutaneous procedures performed with imaging guidance. Code 32556 or 32557 will be used for percutaneous placement of an indwelling pleural drainage tube. Codes 32555 and 32557 include the imaging guidance (fluoroscopic, ultrasound, CT, or MRI). The description for code 64561 has been changed to indicate this inclusion of fluoroscopic guidance, so it now reads as Percutaneous implantation of neurostimulator electrode array; sacral nerve (transforaminal placement) including image guidance, if performed. Imaging guidance always has been a bundled component of neurostimulator implantation; this just formalizes the policy. There is one new code: 64615, Chemodenervation of muscle(s); muscle(s) innervated by facial, trigeminal, cervical spinal, and accessory nerves, bilateral (eg, for chronic migraine). Code 64615 should not be reported in conjunction with codes describing chemodenervation of unilateral muscles innervated by the facial nerve for other reasons (eg, blepharospasm, hemifacial spasm) or chemodenervation of the neck, extremity, and/or trunk muscles. The two codes describing unilateral (71040) and bilateral (71060) radiologic supervision and interpretation for bronchography have been deleted and are not being replaced. • Code 72040 has changed from describing two or three views to three or less views. • Code 72050 has changed from describing a minimum of four views to four or five views. • Code 72052 has changed from describing a complete procedure, including obliques and/or flexion and/or extension, to six or more views. Similar to thoracic and lumbar spine procedures, cervical spine X-rays will be reported by the number of views instead of the type of views. There has been no change in the recommendation to use code 72020 for one view of any section of the spine. Three new codes have replaced the four existing codes that describe thyroid imaging. There will be only one code for uptake, one code for imaging, and one code for the combination of the two. It will no longer matter whether one uptake is performed or multiple; the code will be the same. • 78014, Thyroid imaging (including vascular flow, when performed); with single or multiple uptake(s) quantitative measurement(s) (including stimulation, suppression, or discharge, when performed). Two new codes have been established for reporting parathyroid SPECT, and the description for the existing code for parathyroid imaging (78070) has been changed to identify it as being performed with only planar imaging. The new codes combine planar and SPECT imaging into one code. One code (78071) describes planar and SPECT parathyroid imaging, while the other new code (78072) describes concurrent acquirement of CT images with the planar and SPECT parathyroid imaging. 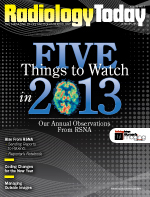 The most extensive CPT coding changes for 2013 involved interventional radiology. All codes describing cervicocerebral imaging have been deleted and replaced with codes that bundle the different ways these procedures may be performed. One code will be used to report procedures previously reported with numerous codes. The codes describing thrombolysis, including the catheter exchange, have been deleted and replaced with comprehensive codes based on each day of treatment. And the codes describing intravascular foreign body retrieval have been deleted and replaced with a single code that includes the radiologic supervision and interpretation. The new codes are all in the 30,000 series of CPT. The American Medical Association is constantly refining the CPT coding system. The trend is to bundle procedures into one code when services are typically performed together. For hospital billing, the CMS already has bundled payments for multiple services performed together, such as imaging guidance for biopsies and cyst aspirations. Creating codes that combine the two is a logical next step. Expect to see more codes that encompass procedures that are currently reported separately. — Ruth E. Broek, MBA, RT(R), CIRCC, CPC-H, CCS, CHC, has been a consultant in procedure coding for more than 25 years, with an emphasis on radiology and cardiovascular coding. For the past 12 years she has been affiliated with ZHealth, LLC and is the primary author of the Diagnostic Radiology Coding Reference, the fourth installment in the Dr Z’s Medical Coding Series. • Code 71035, Special view chest, should be reported for only a lateral view of the chest. Since code 71010 specifically states frontal view, it cannot be used for other single views of the chest. • Postclip placement mammography may be reported separately when performed on a different piece of equipment than the breast biopsy was. Previously it was modality specific; it is now equipment specific. • Ultrasound imaging of a breast biopsy specimen is reported with the unlisted code 76999. Do not use radiographic code 76098. • For hospital billing under the Hospital Outpatient Prospective Payment System, modifier -52 (limited procedure) may be appended only to codes describing procedures that do not utilize anesthesia. To report limited procedures that use anesthesia, modifier -74 should be appended instead of -52. This is a significant instruction from the Centers for Medicare & Medicaid Services as modifier -52 discounts 50% and modifier -74 does not discount the ambulatory payment classification payment. • When noninvasive vascular duplex Doppler imaging of the extremities is performed and spectral imaging and color flow are not documented, the procedure should be reported with the CPT code describing a nonvascular ultrasound of the extremity, not with the duplex Doppler code. Color flow and spectral imaging are required to report a duplex Doppler procedure. • The codes describing duplex Doppler of abdominal, pelvic, scrotal contents, and/or retroperitoneal organs state with arterial inflow and venous outflow. If both are not performed, the complete procedure (93975) cannot be reported. Limited procedure code 93976 should be reported instead. • Code G0365, Vessel mapping of vessels for hemodialysis access (services for preoperative vessel mapping prior to creation of hemodialysis access using an autogenous hemodialysis conduit, including arterial inflow and venous outflow, may be reported only one time on a date of service. It cannot be reported with a -50 (bilateral) modifier, two units of service, or with –LT and –RT modifiers.